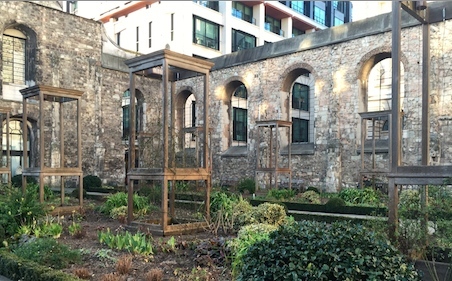 A garden covers the space formerly occupied by the Greyfriars Christ Church. The original site was not rebuilt after its destruction in 1666. The avenue of wooden towers, representative of the original thirteenth century church towers, marks the locations of the former medieval nave. 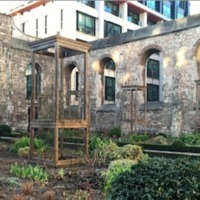 Photo by Marina Elgawly, “Greyfriars (ruins, view of the nave in 2015),” Medieval London, accessed April 22, 2019, http://medievallondon.ace.fordham.edu/items/show/163.